In Thailand, it’s believed that throwing coins onto a turtle will bring longevity and good fortune. For many years, a female green sea turtle in the eastern town of Sri Racha had to endure this superstition while wading in a public pool. She consumed 915 coins in the process. Early today, veterinarians in Bangkok operated on the 25-year-old turtle, removing each coin one by one. 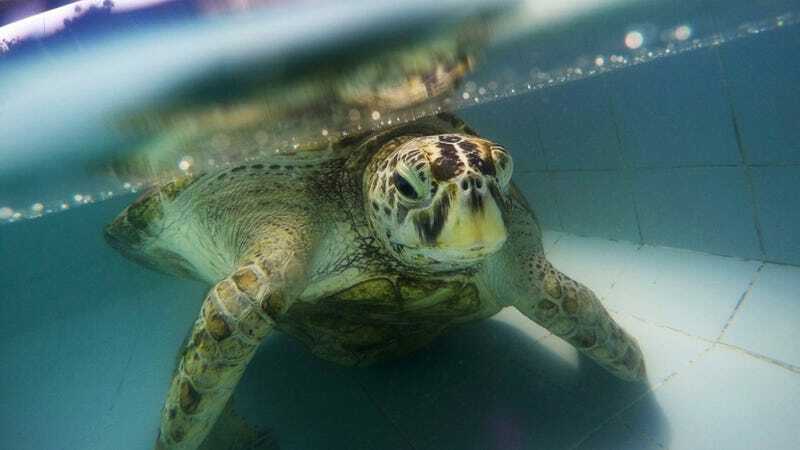 The 25-year-old green sea turtle, appropriately named “Bank,” had been gobbling up the coins as tourists tossed them at her while she swam in her wading pool. These coins eventually formed a heavy ball in her stomach weighing 11 pounds (5 kg). Then, those loose change caused a crack to form in her ventral shell, which got badly infected. Sick and nearing death, the navy was called in to deliver the turtle to veterinarians. 3D scans revealed the horde of coins, including a pair of fish hooks. A team of five surgeons from Chulalongkorn University’s veterinary faculty removed the coins while Bank was under general anesthesia. During the course of the four-hour operation, the surgeons took out each coin one by one through a 4-inch incision. Many of them were corroded or partially dissolved. Around 15,000 baht ($428) in donations was raised from the public to pay for the surgery. The turtle will be placed on a liquid diet—of a different kind—for the next two weeks. Assuming Bank gets better and she’s allowed to return to her stomping grounds at her pond in Sri Racha, it’s not clear if tourists will still be allowed to toss coins at her. Which, given her penchant for loose change, should probably be put to a halt.